A wallpaper created and inspired by the Glasgow Gallery of Modern Art (GoMA) atrium space and exhibited across the three floors in 2014. This collaborative and site specific project showcases a graphic representation of bravery. We reinterpreted the GoMA balconies in the forefront of the design from various viewpoints creating a disorientating effect with figures balancing and climbing on them. The busy background pattern combines elements which represent of the word brave and the groups response to the idea of bravery. 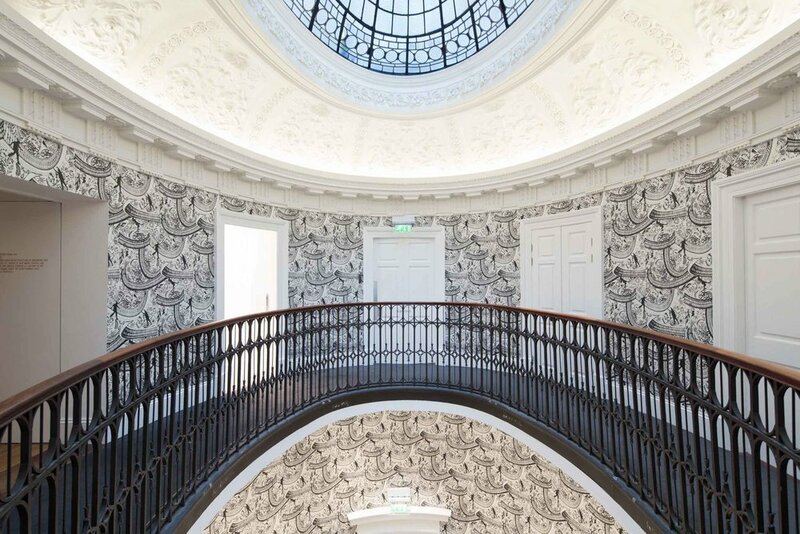 Three hundred metres of monochrome wallpaper was printed in our Glasgow studio and installed horizontally in GoMA’s gallery space. We worked with Brave Generation, a selected group of young people aged between 16 -24 from different backgrounds. The group worked between Tramway and GoMA as part of GENERATION: 25 Years of Contemporary Art in Scotland. Would you like to receive up to date news/offers from Bespoke Atelier?